Not all mushrooms look like Toadstools - a rounded cap atop a short stem. The ones that do not are exceptionally varied - from fractal fantasies to migrating blobs that actually wander around before settling in to make spores to other forms to varied to trivially describe. My son and I have been dealing with the almost total absence of Boletes this year (not a single Butter Bolete or edulis this year!). Fortunately, other species are doing well - and some of them are quite amazing. "Higher Fungi", the subkingdom Dikarya of the kingdom of Fungi, contains two large divisions, depending on how spores are made: Ascomycota with spores on a microscopic structure called an ascus (these are sort of like a bunch of spores in a straw, or peas in a pod, sort of arrangement), and Basidiomycota with spores on a microscopic basidium structure (generally a group of spores at the tip of a club-shaped structure, or spores arranged like fingers are arranged on a hand). Of commonly seen mushrooms in supermarkets, only Morels are in the Ascomycota. These look like fractal forests and other fantastical forms. The spores are borne on the outside of the branches, not on gills under a rain shield (cap) as on the more commonly seen sorts of mushrooms. Even with that distinction, these are kin to the supermarket button mushroom, as the spores are borne on a structure called a basidium, making Coral Fungi members of the division Basidiomycota. The Clavulina cristata shown above is common in our yard this time of year, usually with multiple flushes. Some local Coral Fungi are brightly colored, occasionally growing in clumps the size of cabbages. 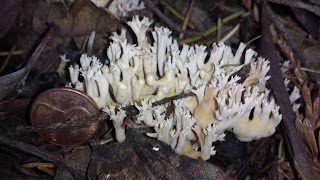 Generally similar looking species are in the genera Ramaria and Clavaria among others. These are in the group Ascomycota, which bear their spores on a structure called an ascus. They are distant relatives of Morels, and often useful (in our yard at least) in indicating where we may wish to watch for Morels appearing later in the year (late Winter or early Spring, typically). This showed up in our orchard compost pile, an erratically attended affair that has been idle for half a year. 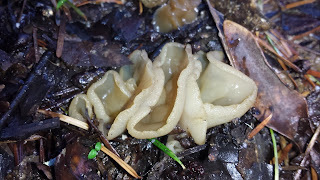 It appears to be a Peziza species, perhaps P. repanda, the Spreading Brown Cup Fungus. A good resource for starting to explore the fungal diversity of California can be found here on MykoWeb.